11.4 miles | 6.5 hr. I set out alone today on Moosilauke for a variety of reasons. I hadn’t hiked solo since early July, I wasn’t feeling that well, and I felt as if I’d had way too much social contact lately. I needed to get away from it all and have my own adventure for a change. Much of my hiking earlier in the year was done alone, and I felt that I needed to get back to that. We all hike for different reasons, and for me, the feeling of being alone in the wild is one of the most desirable emotions achieved through hiking. I hit the Glencliff Trail at 7:30 am during a brief respite from the rain. The trailhead was underwater; little did I know that this would be one of the driest spots of the hike. The path begins as a gentle, scenic foray through some woods and a beautiful pasture. Apple trees lined the way, producing a strong, delicious aroma. Combined with the sparkling fall colors and soft patter of raindrops, it excited all the senses. After scaring away a small bunch of turkeys, I exited the pasture, encountered my first stream crossing and entered the woods. I was already feeling the weight of deadlines, responsibilities, and the other banalities of city life dropping from my shoulders. I felt awake and alive. Today would not be about peakbagging, making good time, or hiking someone else’s plan. Today would be about experiencing nature for myself and letting go of the nonsense that normally consumes my life. My allergies are the worst in the morning and I had been battling a cold for about a month, so the slow ascent took a toll on my lungs. I took every photo opportunity as an excuse for resting and catching my breath. There was no shortage of amazing scenery, interesting fungi, colorful leaves, or delicate vegetation. I was captivated by all that surrounded me. I wandered along the trail, half in a dream, constantly smiling and looking up at the rain. I was warm, and only used my jacket as a hood and cape over my backpack, so I could feel the raindrops on my bare arms and face. The raindrops were soothing. There were times that I was completely aware of every inch of wildness that surrounded me and there were times where I was so deep in thought that I may have been walking through outer space. My mind was at once gripped with such feelings of complete peace and happiness that nothing else mattered but the present. I am not a spiritual, religious, or hysterically emotional person. But, this was probably the closest I’ve ever had to a spiritual experience. 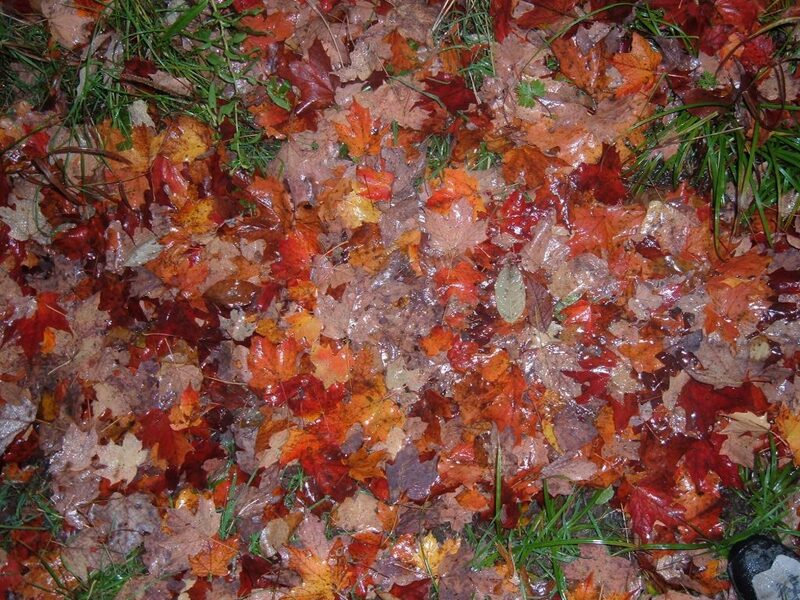 I wanted to cast off my pack, lay down on the wet leaves and soak in every bit of the moment. After a short snack break I began noticing the trees getting shorter and I knew I was nearing the Moosilauke Carriage Road. As I approached treeline, I snapped out of my spiritual daze and the adrenaline started to flow. I reached the south summit spur, followed it out to its large, open tracts and imagined theview that would be there. Not feeling much love for that place at that moment, I quickly returned to the main trail. 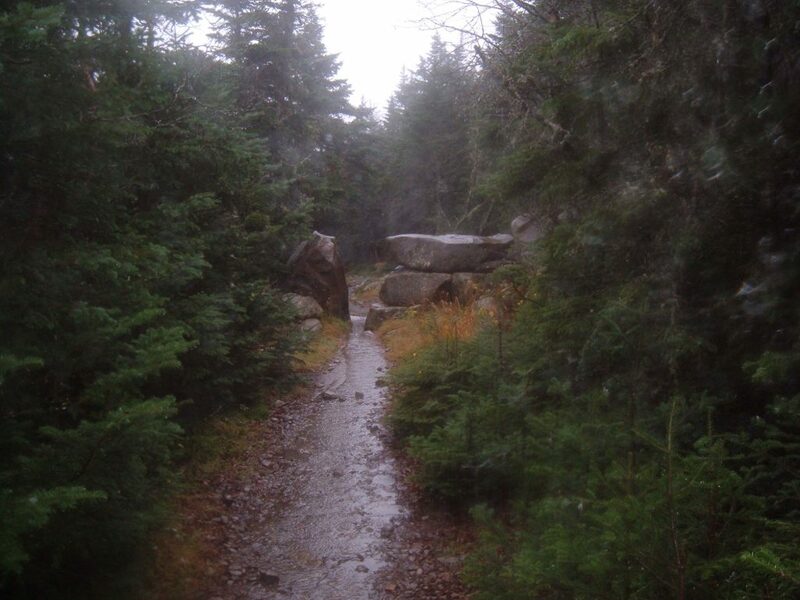 The last half-mile or so to the Moosilauke summit was wet and windy. The short spruce that lined some of the trail provided a substantial amount of protection from the elements. Once I stepped out from behind that barrier, I felt the full effects of the weather. 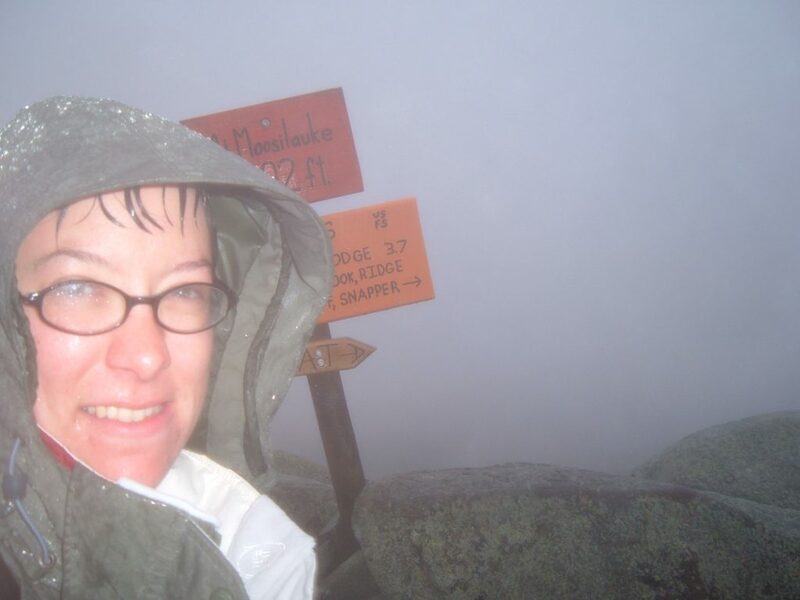 At that point, however, I felt such a rush of hiker-as-adventurer/conqueror that the rain driving into my cheeks and legs did nothing to slow my pace or dampen my spirit. I felt a burst of energy and a new motive for hiking. My heart raced and my smile broadened as I swiftly walked past the towering cairns to the bright orange summit sign. I threw my hands up over my head, spun around dramatically and absorbed all of the awesome power of nature hurling itself at me. Now the moment was not about a solitary reflection on life but about a struggle between (wo)man and nature face-to-face on a barren playing field. On a slightly nicer day I could have explored up there forever. But I was starting to feel a little chilled, so I snapped a few photos and bounded back down the trail. 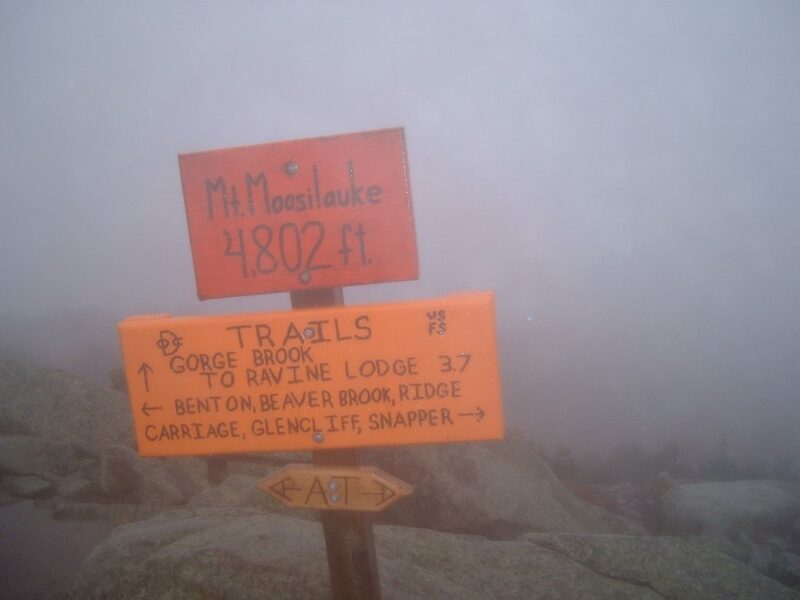 Summiting those bare peaks is invigorating. I loved that I had Moosilauke completely to myself. The moment was mine. I left with the desire to return soon. I quickly reflected on the progress of my day thus far: a gentle ascent with many pauses to appreciate my slow but steady progress, an overwhelming emotional experience in the weather , followed by a gradual anticipation of treeline, finishing at the dramatic summit. I anticipated a long, thoughtful descent through a mixture of terrain and simple observations about life, friends, and nature. Although the way had been wet so far, and I was now completely soaked from the waist down, I had no idea what I would be in for during the second half of my adventure. The Moosilauke Carriage Road provided a pleasant, easily graded walk through the forest. I didn’t have to exert myself much going down so I put on a fleece vest to help keep my core warm. And to think, at the beginning of the hike, I thought I had overpacked! I continued in my attempt to keep as dry as humanly possible, walking on the edges of the trail and hopping on the rocks and raised bits of mud. Eventually, my socks became so saturated that my efforts were fruitless. I changed into my spare, dry socks and continued down the road. Approaching the Hurricane Trail, I noticed that the water levels seemed to be rising significantly. Rivers rushed by loudly and dramatically. Footing became less sure. Although the fall leaves are pretty, they cover up the loose rocks, deep puddles of water, and other surface features of the trail. I started to slow down to prevent ankle injury or any other stupid mistakes. The Hurricane trail ascends, relatively steeply in some parts, up Hurricane Mountain (3K’r). 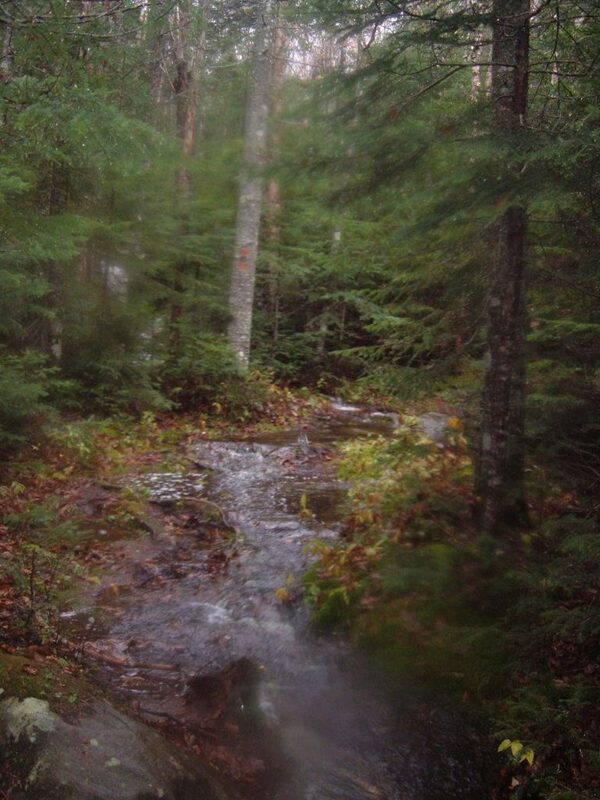 The trail soon became indistinguishable from the myriad streams in the area. There were some points that I had to stop and look around to assure myself that I was, indeed, following a trail. There were blazes on a few random trees and sparse bits of orange flagging along the way. These little reminders did wonders for my confidence, but they were few and far between. Several times I remember pausing, laughing, and wondering where I was supposed to go and how I would get there. There were streams running alongside trails that contained less water than the trails themselves. There were also flattened areas of forest that were completely flooded. A few fallen logs and small piles of vegetation served as areas for semi-safe passage, but most places required hip-waders and/or a kayak. I clung desperately to trees a few times before realizing that most of the trees were not really good for that purpose. It took a fallen tree to the back of the head and a branch in the face before I stopped grabbing on to them. Sometimes my intelligence is amazing. 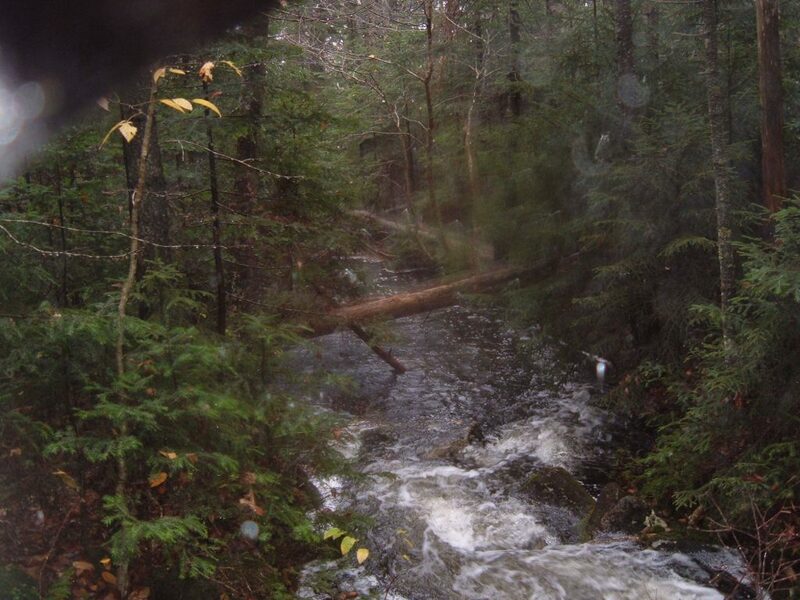 That’s the trail, not a stream. 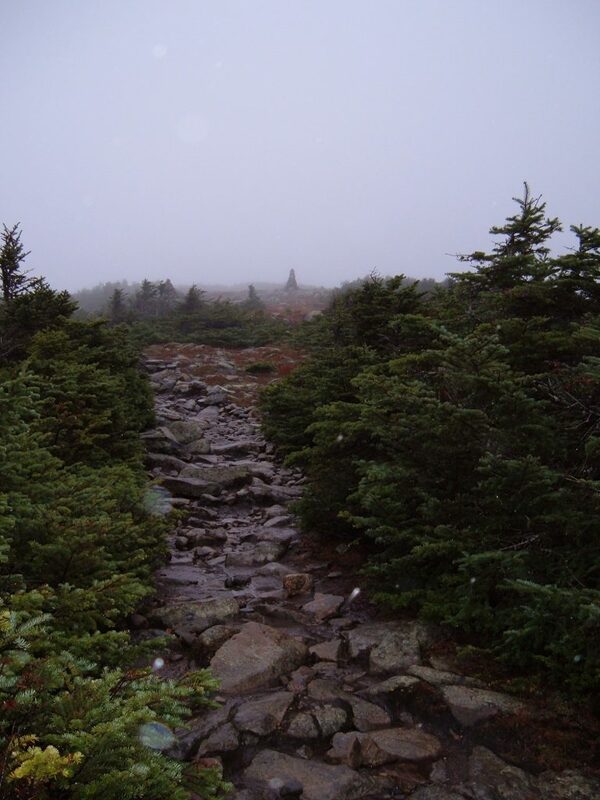 As if the ascent wasn’t bad enough, I then had to climb down from Hurricane Mountain, almost constantly in a stream. Walking upstream was a little more mentally okay. I started to worry a bit more when the water was moving in my direction. The rocks and moss were very slick, which I discovered while slipping and sliding my way down the trail. Again, my socks were completely saturated. After a while I figured it would be easier to just accept the fact that I was wet and just splash right through the water. It made footing decisions infinitely easier. With probably about a mile to go, I came across two backpackers heading up. We chatted for a few minutes, I warned them that the trail would be submerged and hard to follow, and they went cheerily on their way. They were in very good spirits for such a yucky day. So was I. I knew any people I encountered on a day like today would be pretty cool dudes. I am sure they forded the trail just fine. My epic journey would shortly end. It felt like a physically and mentally cleansing trek. The symbolism was hard to miss. As I entered the pasture and sloshed down the home stretch to the road, I was somewhat sad that it was all over. I felt that I really accomplished something today. My body and mind felt clear and refreshed. I even felt as if I’d knocked my cold out. I promised myself that I’d leave more time for solo hiking as long as the weather permits. It has been great these past few months meeting so many new people and having wonderful new experiences, but ultimately the one person I need to keep happy is myself. Having my own plans, my own moments and experiences is vital for self-preservation. I hope that I get to feel like this again sometime soon. This entry was posted in Hiking, New England and tagged hike366 on October 15, 2005 by Jess B.
I came across your blog and wanted to say that its great that you’re back out so quickly after your injury! I myself up 8 weeks out from a Lumbar Fusion with hardware at the L4/L5 section and have been back out on a couple of smaller hikes around Lonesome Lake and the infamous Dickey-Welch Loop as well as Mt. Monadnock located a few miles from home. Keep up the great work and look forward to reading more of your entries. This is still one of my favorite trip reports. And one of my favorite experiences. I have been up Moosilauke in winter, too, it’s really nice in the snow. Enjoy those east coast mountains for me because I don’t think I’ll be back any time soon!